Rotor Mixers – Admix, Inc. This motor turns the small blades that blend your ingredients into a delicious smoothie when you turn it on. The high speed spinning motion combined with the chopping ability of the blades allows for fast processing of any foods placed in the blender. This same method is also used on a much larger scale for rotor mixers in a variety of industrial applications. 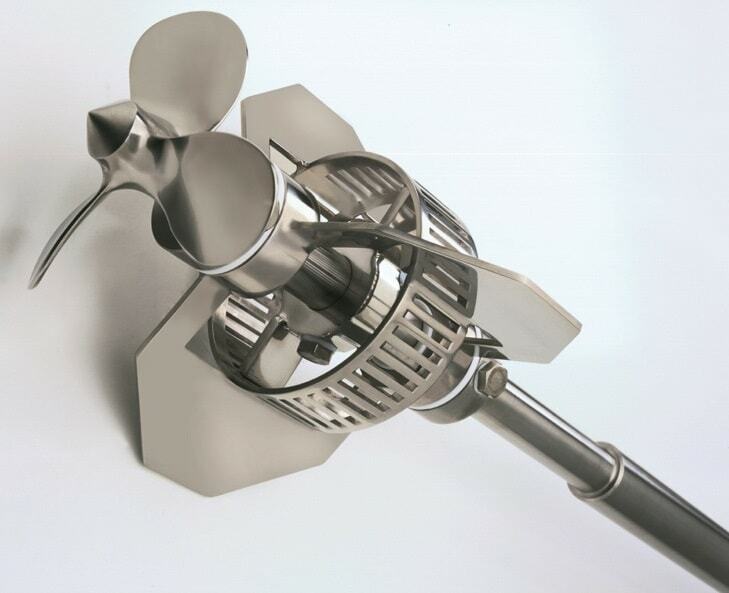 When a large rotor mixer is used for industrial purposes like chemical mixing or combining food ingredients, a strong electric motor is necessary to create enough power to mix substances of varying densities at high speeds. The rotor is fitted into the bottom of a large stainless steel drum, and it spins at speeds controlled by an exterior control panel. Sometimes blades or flat mixing arms are the rotating instrument, but many industrial rotor mixers are fitted with what is known as a rotor-stator head. This is a long narrow piece attached to the motor that reaches almost to the top of the container or tank. The rotor-stator has slotted openings that draw materials in and then hurl them outward again, creating a strong centrifugal force. This helps to break materials down to the smallest possible particle size. Rotor mixers are used in industries like adhesives, chemical processing, food technology and production, pharmaceuticals, ceramics and more. Some rotor mixers are built to operate with different types of attachments, so when the tank is empty a head can easily be detached from the motor and replaced with a more appropriate implement. This can be very useful in industrial settings where the rotor mixer is needed for multiple types of mixing jobs. For instance, a ribbon blender could be used in place of a rotor-stator to mix powders, pet foods and seasonings. These are dry substances that require the spiral blades of a ribbon blender to move through the circumference of the entire container rather than create the centrifugal force generated by a rotor-stator and most often used in liquid mixtures. Rotor Mixers A rotor mixer uses metal blades or arms installed at the bottom of a container. These blades spin at variable speeds to mix substances. A basic and very common example of this is setup can be found in an everyday blender. A blender has a small electric motor that can operate at several speeds.